$3181.32+ No ketchup, no RGB, just sauce. Quiet, quiet, quiet. Provides more than adequate airflow for normal applications without any noise. Unbelievable quite especially with as much air as it moves. Supremely quiet, a marked difference from the included fans in my Phanteks p400s case. Comes with a plethora of extremely useful accessories: extension cable, splitter, silicone mounts, low noise adapter. An unfortunate color scheme, but no windowed case for me and not big on aesthetics. Function over form! Exemplar of what a case fan should be. Silent at idle, lots of air moved at full speed, enough accessories to choke a horse and a six year warranty. Accessories include a PWM Y-cable, PWM extension cable, "LNA" (fancy term for a voltage throttler to reduce max speed), and four rubber knobs for "anti vibration" mounting (in addition to normal fan screws). These fans keep my PC cool while also being reasonably quiet. Like the included cables.......Y, short, & long extender. I can't remember how I was living my life without these fans. Excellent case fan. 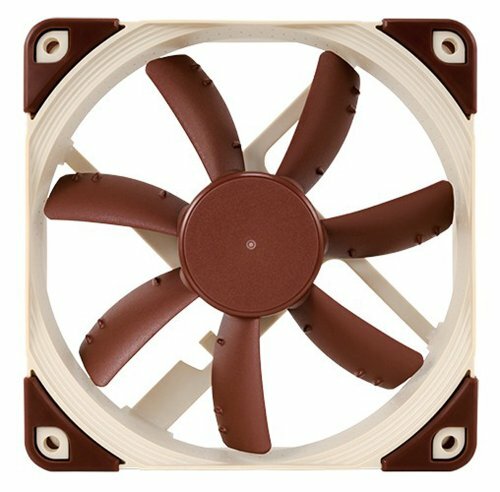 It's important to choose the right fan--this one is designed for case mounting and it delivers a tremendous amount of air right to the CPU cooler, which in my build does make a big difference for cooling. Extremely quiet workhorse of a fan.